In a Nutshell: Training new or existing employees can be an expensive process that costs businesses time, money, and manpower resources that are hard to replace. Human resources offices often dedicate an employee to oversee training and the signing of new-hire paperwork, which adds to the costs with document printing and storage. 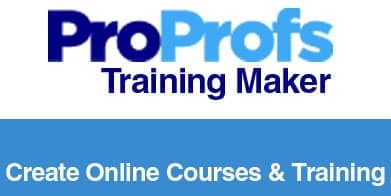 ProProfs is a leader in providing online training and educational tools to more than 1.2 million businesses, educators, and students worldwide. The platform offers pricing tiers that allow an unlimited number of learning modules and learners, and gives companies the capability of storing historical data on users outcomes and experiences. Starting a new job can be a stressful process. Not only can it be awkward being the new person in an established environment, but going through onboarding processes like human resources and technical training can force a lot of information on a person in a short amount of time. Initiating new employees can be just as stressful for businesses. The paperwork and manpower that goes into training a new hire can be time-consuming, expensive, and take away resources from other important projects. Modern technological advances make completing most everyday jobs easier and more efficient, but required HR tasks have long remained resistant to change because of the legalities that go along with the verification of signatures on key pieces of paperwork. Those processes get a modern makeover with the ProProfs online learning platform. Already a leader in web-based quiz, training, and survey creation, ProProfs has expanded its products in recent years to offer customizable polls, brain games, flashcards, and live chat software for businesses, educators, or individuals. More than 1.2 million businesses, educators, and students use ProProfs tools to conduct educational activities around the globe. Major enterprise clients, including Sony, Dell, and Cisco, have experienced the cost savings of conducting ongoing training activities online as opposed to the more traditional route. Hasan said customers who use ProProfs save, on average, 70% of their training costs over traditional onboarding methods but still retain control over the training since they create the information presented in every module. A majority of ProProf’s customers come from the US, but Hasan said the company has a growing network of users in Australia, Europe, the UK, the Middle East, and Africa. The platform’s adoption by nurses in Africa was so successful that Hasan said he regularly receives thank-you notes from those customers who claim the online training helps them learn more about their profession. Upper ProProfs pricing tiers allow unlimited access to training and quiz modules, as well as any other service customers sign up for. Hasan said one of the company’s largest customers initiates as many as 90,000 learning sessions across the globe each week. On average, approximately 1,500 users are online and taking courses each hour across the platform. ProProfs has a tiered pricing plan for all of its services with competitive packages for nearly budget. Each tier is based on the number of learners and the amount of storage a company requires. All services include a 30-day money-back guarantee and the ability to change plans at any time as a company’s needs adjust. Customers using ProProfs for employee training have a wealth of information at their fingertips thanks to the company’s Tin Can API compliance. Also known as Experience API, the interface allows customers to track more information about user learning behavior by collecting, analyzing, and storing information from training and quiz attempts. ProProfs allows customers to import previous learning data so they can analyze it alongside data driven from new modules. “When you have historical and the latest data on your employees, you can map them both and drive conclusions from the outcomes displayed,” Hasan said. Guided learning modules help companies and instructors design specific tracts for training or instruction that won’t allow a learner to skip to the next module without fully completing the current lesson. Hasan said companies that keep strict records of what learners have completed have fewer long-term compliance issues and a better record of successful hires. ProProfs platform guides training and education programs worldwide and continues to push the boundaries of what modern learning looks like. The company remains on the cutting edge in its field and aims to add features in the future that will continue to shape the way learning takes place around the globe. Customers create training or learning modules with tools that make the educational experience easy and frictionless for users, regardless of their technological know-how. Some of the world’s biggest companies and institutions of higher learning benefit from the features and ease of use within the ProProfs platform to drive learning, improve compliance, and save on their bottom line.